PETALING JAYA: Sime Darby Bhd is taking a re-look at some of its property joint ventures and, where possible, is seeking to unwind out of ventures that do not create maximum value for itself. It is also in no hurry to list its Indonesian plantation arm, as was earlier speculated, preferring to enhance efficiencies before such an exercise. “Sime Darby periodically reviews investment projects including joint ventures to ensure that they are still in line with the group’s strategic objectives and that the projects are giving Sime Darby the maximum val ue,” Sime Darby said in an email reply to questions from StarBiz. Earlier this year, it had been speculated that Sime Darby was planning a listing of its Indonesian plantations on the Jakarta Stock Exchange next year. Following the mega merger that completed in November 2007, Sime Darby inherited Kumpulan Guthrie and Golden Hope’s Indonesian plantations. Sime Darby has more than 200,000 ha of planted area in Indonesia. However, it is understood that CEO Datuk Mohd Bakke Salleh is not in a hurry to pursue such a listing, hoping to increase the yield from the plantations there in order to derive a better valuation before a listing is pursued. According to reliable sources, some of Sime Darby’s property joint ventures that may be studied closely by Bakke and his team are believed to include the RM1bil development in Shah Alam with Sunrise Bhd and other ventures formed with the Brunsfield Group. The 50:50 joint venture with Sunrise was inked in January to develop 21 acres in Bukit Jelutong to consist of retail, shopoffices, officesuites and serviced apartments. The 60:40 joint ventures with the Brunsfield Group had been done earlier, since 2006, to develop property projects such as Subang Avenue, Oasis Damansara and the redevelopment of Oyster Cove, an exclusive waterfront resort on Australia’s Gold Coast. These projects had been questioned before, on the basis that Sime Darby is likely to be able to extract more value if it carried out the developments itself. Sime Darby’s property division enjoyed a 28% profit margin last year and some analysts said that the division could have reaped a much higher ma rgin. This is considering that its land cost is typically lower than that of most other property developers. Ivy added: “The new CEO believes that Sime Darby has a strong property brand name and intends to build the group’s property expertise to encompass all the types of property development projects." SINGAPORE: Singapore moved yesterday to discourage short-term speculative real estate investing as property prices soar to record highs amid a rapid economic recovery. Bank loans for second homes will now be limited to a maximum of 70 per cent of the value of the property, down from 80 per cent previously, the National Development Ministry said. The government will also impose a tax on houses sold within three years of purchase, up from one year. "The property market is currently very buoyant," the ministry said in a statement. "The government has decided to introduce additional measures now to temper sentiments and encourage greater financial prudence among property purchasers." Prices of private residential housing rose to a record high in the second quarter, fuelled by a surging economy that expanded 18 per cent in the first half as manufacturing rebounded from last year's global recession. Prices of public housing, where 80 per cent of Singaporeans live, have risen five straight quarters to record highs. "The frothy sentiment has spread to the public housing market," said Wai Ho Leong, an analyst with Barclays Capital. Leong said a surge in residential units planned and under construction will boost supply and help dampen prices. Singapore's low crime rate, good schools and low personal and corporate taxes have helped the island rank near the top of expatriate global quality-of-life surveys and attracted investors to the residential and office property markets. "Should economic growth falter and the market corrects, property buyers could face capital losses, with implications on their own finances and the economy as a whole," the ministry said. "The current low-global interest rate environment will not continue indefinitely." The government earlier this year imposed a 1 per cent to 3 per cent tax on residential properties sold within one year of purchase and lowered the loan-to-value limit to 80 per cent from 90 per cent on loans for private housing. Officials have also pledged to release more government land for real estate development to help boost housing supply. Private residential property prices rose 11 per cent in the first half, the ministry said. "We've twice acted to cool the property market, once last year and once in February this year, but the prices are still rising," Prime Minister Lee Hsien Loong said in a speech on Sunday. "I think we need to do more." "The latest measures are motivated largely by the unabated rise in public housing prices," an analyst said, noting the 4.1 per cent increase in HDB resale prices in the second quarter exceeded the average of about 3.0 per cent in preceding periods. PETALING JAYA: The Malaysian Accounting Standards Board (MASB) has deferred implementing the much-debated accounting practice that recognises developers’ revenue only on completion of projects to 2012, MASB announced on its website yesterday. Under the current system, developers report profits progressively. The new ruling under the International Financial Reporting Interpretations Committee (IFRIC) 15 is deferred to Jan 1, 2012 after much deliberation among property players and accounting associations and the Securities Commission (SC). MASB said the deferment was necessary to enable further deliberation on how the move would affect the property sector. It was supposed to have been implemented on July 1 but met with opposition from developers. The deferment would give MASB the opportunity to get more feedback from industry players on a proposed new standard on revenue from contracts with customers, MASB said. “The proposed new standard, anticipated to subsume IFRIC 15 requirements, is expected in the middle of next year,” MASB said. The proposed IFRIC 15 has been met with criticism from local property players. Real Estate and Housing Developers’ Association Malaysia (Rehda) president Datuk Michael KC Yam said he was pleased that the proposed ruling had been deferred. “That’s good news. It would have been detrimental had it not been deferred,” he told StarBiz. In April, Rehda wrote to the MASB seeking clarification on the implementation of IFRIC 15, given the current legal framework and practices in Malaysia. Rehda also set up a task force, assisted by accounting and legal experts, to address issues arising from Malaysia’s adoption of the IFRIC 15. “Our (Rehda’s) stand is that the ruling was too much of a reflection of the system practised in Europe and America where only upon (project) completion does the developer get to recognise profits. Yam said Rehda had subsequently engaged in a series of meetings and discussions with MASB, the Malaysian Institution of Accountants and the SC to recognise the fact that the existing system was unique and that more time was needed before a final decision was made to implement the IFRIC 15. MASB also said on its website that it had hosted a special forum on Aug 16, and noted that the primary business model of the real estate industry in Asia, namely the “sell and build” concept, might be different from real estate business models employed in other jurisdictions. “Therefore, it would be timely and more productive for stakeholders to analyse and provide timely input to the IASB (International Accounting Standards Board) for consideration before they finalise the standard on revenue from contracts with customers,” it said. Yam said he hoped the system that would be implemented in 2012 would be a modification of the IFRIC 15 in some way. “I hope that by 2012 there will be some changes to what was supposed to be implemented initially. Our system is not perfect. We need to study other standards to come up with a suitable one,” he said. PETALING JAYA: Selangor State Development Corp (PKNS) will be signing a series of agreements to mark its entry into the real estate investment trust (REIT) industry. The signing ceremony is scheduled for Thursday. PKNS’ prime properties will be put under the PKNS REIT. News of the company’s plan to go into the REIT business emerged last year but attempts by StarBiz to gain more information from PKNS were unfruitful. Reports earlier had stated that PKNS was negotiating to buy a controlling stake in a listed REIT with total assets worth more than RM600mil. Its general manager, Othman Omar, declined to name the REIT. He said PKNS wanted to enter the REIT market in order to grow. It would also enable PKNS to leverage on its stable of properties by doubling its value to over RM1bil. It would be putting Wisma PKNS, Kompleks PKNS, the 500,000 sq ft Shah Alam City Centre mall and the Shah Alam convention centre into the REIT. PKNS still has some 12,000 acres of landbank in Selangor, strategically located in such areas like Setia Alam, Bukit Cerakah, Gombak and Klang. It has vast experience in mixed development comprising offices, retail, hotel and serviced apartments, having developed among others the SACC Mall in Shah Alam and Menara PKNS in Petaling Jaya. Banks may not be in favour of a potential move by Bank Negara Malaysia to tighten mortgage lending rules unless it is limited to just high-end properties, analysts say. It was reported that the central bank is seeking feedback from banks on the possibility of capping the loan-to-value ratio (LVR) for mortgages at 80 per cent to avert the risk of a potential property bubble. Currently, there is no fixed LVR. Banks usually lend up to 90 per cent of a house value, or even up to 100 per cent in some cases. "Banks are unlikely to be in favour of it as it will affect their profitability," said a banking analyst at a local research house. Still, BNM is likely to be mindful of this and if it feels that such a move is necessary to curb property speculation and a potential rise in non-perfoming loans, it may reach a compromise in that it may not slap the 80 per cent cap across the board, he pointed out. "We believe that it is unlikely that BNM will enforce a strict capping of LVR ... across all residential property classes, but rather impose a restriction only on higher-end properties where the speculative element could be more apparent," OSK Research said in a note to clients yesterday. Kenanga Research said it wouldn't be surprised if BNM implemented the 80 per cent cap on, at least, properties valued at more than RM500,000. The central bank's concerns about a potential bubble are warranted, nterest rate hikes this year, loan growth has remained robust while deposit growth has lagged, due in part to the channeling of retail deposits into property purchases. Residential properties currently account for 26.6 per cent of total industry loans. Still, OSK felt that it was not feasible to set a blanket enforcement on the LVR, pointing out that residential properties were considered one of the safer asset classes for banks to lend to, with promising growth prospects underpinned by the country's relatively young population. As it stands, it is understood that most banks already have an internal risk control policy, limiting the LVR to 85 per cent for higher-end residential properties valued at more than RM700,000. Most banks also have a LVR cap of 85 per cent for non-residential properties. OSK noted also that LVR was just one of several criteria that banks use in their credit scoring process. They also tend to look at the debt servicing ratio, location of property and the borrower's other financial backing. Meanwhile, any mortgage restriction is also seen to be negative for the property sector. Kenanga Research said it is likely to downgrade the sector from a "trading buy" now if the restrictions are implemented as property transactions will fall since deposit requirements will basically double. "If the LVR is official at 80 per cent for all borrowers, we see a negative impact on the property sector, especially on the low- to medium-end market as housebuyers will need more equity under the new scheme," said Maybank Investment Bank research. For example, a housebuyer would need RM80,000 instead of RM40,000 as equity for a RM400,000 house. "This could cause a delay in purchasing decisions," it noted. RHB Research, meanwhile, felt that first-time home buyers should be exempted from a higher downpayment ratio since the government has been encouraging home ownership. PETALING JAYA: Olympia Industries Bhd is yet to make a decision on the fate of its Menara Olympia property located along Jalan Raja Chulan in Kuala Lumpur following the decision by Jelita Timur Sdn Bhd to abort the acquisition. Olympia’s corporate communications senior manager Jennifer Chow said in an email reply to a StarBiz query that the board of directors “has yet to make any decision following this announcement”. The company had on Aug 26 received a letter from Jelita Timur, which highlighted the uncertainties over the acquisition, including the delay on Olympia’s part in obtaining the requisite approvals for the transaction. Jelita Timur, in the letter, had also said that it was not prepared “under any circumstances” to proceed with the transaction at a higher consideration. Following a second valuation of the property by Rahim & Co as directed by Bursa Securities, Olympia’s board had announced last Friday that the property was valued at RM228.1mil. Collier, Jordan Lee & Jaffar Sdn Bhd valued the property at RM202.65mil in January, which was deemed low by analysts. Olympia’s board said yesterday in an announcement that there was a unanimous agreement to mutually abort the transaction to avoid the possibility of being sued for specific performance and higher compensation sum for breach of obligations under the sale and purchase agreement (SPA), which was signed on April 9 and would fall due by Sept 9. The board added that the timeframe for the completion of the SPA was unlikely to be achieved after taking into consideration the Sept 9 deadline and the uncertainties. PETALING JAYA: The Employees Provident Fund (EPF) will invest £1bil (RM4.88bil) in properties in the UK, the pension fund said in a statement yesterday. “The investments would be for long-term with expected annual yield of 6% to 7%,’’ the statement said. The fund did not identified any specific property. The statement came in response to a UK news report published on Sunday that said the EPF had appointed ING Real Estate Investment and Deutsche Bank’s property investment arm RREEF to manage the £1bil investment. They will each invest £500mil in European property markets, focusing on the UK. Several significant stakeholders urged the EPF to be careful in handling the venture. MTUC president Syed Shahir Syed Mohamud said such a big move by the fund would have already gone through a deliberate process and consultations with experts. Fomca secretary-general Muhd Sha’ani Abdullah said EPF must be held accountable with the venture, adding that deals should not be made secretly. “Every deal should be immediately announced. Huge investments usually means bigger risks. “We have seen how highly successful organisations like Lehman Brothers had collapsed due to mismanagement. EPF must be very transparent and careful,” he added. As at March 31, EPF’s total fund size was reported to be at RM402bil, most of which are invested in local bonds and equities. Currently, less than 1% of EPF’s total accumulated fund is invested in properties, well below the fund’s strategic asset allocation target of 5% for properties. “The EPF is desirous to bring this percentage up,’’ EPF said in the statement. But there are valid concern about “crowding out” the market if the EPF uses its massive fund to snap up local assets. Such diversification into foreign asset play would also allow the fund to better manage its risk-return profile. In April, EPF’s chairman Tan Sri Samsudin Osman said the pension fund needed to invest more overseas to boost returns and keep annual dividend above the guaranteed 2.5% rate. It was reported that the EPF had set aside RM10bil for investment in overseas equities and global bonds. EPF said the fund strictly adheres to its strategic asset allocati on designed to maintain consistent returns in the long run within tolerable risks limits for each asset classes. “Even with (the £1bil) investment in the UK, the percentage is still well below the EPF’s strategic asset allocation for properties,’’ EPF said. The EPF said it had zeroed in on the UK property market because that is one of the largest property market in the world backed by a strong Lands Law protecting landlords. “The stable and highly liquid UK property market underlies the rational behind the move,’’ it said. The EPF said that although it had a policy to pursue overseas investments, the fund is also “aggressively exploring the market” in Malaysia. Among local properties owned by EPF includes that Sogo Building, Wisma KFC, MAS training Centre, Giant-operated supermarket outlets and CIMB branches. SEPANG: Malaysia Airports Holdings Bhd (MAHB), which had an initial budget of RM2bil to build the new low-cost carrier terminal (LCCT) may have to pay more for the terminal due to delays in placing out contracts. Managing director Tan Sri Bashir Ahmad Majid said there were still some contract packages that were yet to be finalised. 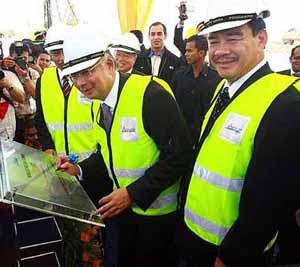 “We see this as good delay because MAHB wants to ensure it gets the right contractors at the most affordable price,” Bashir told reporters after the ground-breaking ceremony for the new LCCT yesterday. However, he declined comment on the additional cost. The new terminal, to be known as KLIA2, is expected to be funded by MAHB’s proposed sukuk (Islamic medium-term notes programme of up to RM3.1bil and commercial papers programme of up to RM1bil). With KLIA2 and the 39 airports that MAHB currently managed in Malaysia, the airport operator would be able to handle at least 60 million passengers annually by 2014, Bashir said. “KLIA2 is expected to handle 45% to 55% of the (total number of) passengers, mainly budget travellers,” Bashir said. Located 2km from the current main KLIA terminal building, KLIA2 is slated to be completed by April 2012 and would be the largest LCCT in Asia with an initial handling capacity of 30 million passengers. Bashir said over the past 10 years, low fare travel had grown and today constituted 16% of total travel in the Asia-Pacific region and 43% in Malaysia, and this percentage was expected to increase. The 242,000 sq m new terminal is four times bigger than the current LCCT, which occupies 60,000 sq m and can only handle 15 million passengers yearly. On the aerobridge, Bashir said MAHB was in favour of building it but would leave the decision to the budget airlines as they feared it might impact turnaround time for their planes. He added that besides the turnaround consideration, there was also a charge of RM85 for each plane using the aerobridge. On the new terminal’s interconnectivity, Bashir said KLIA2 would be connected by buses and express rail link. “There are plans for railway connection in time as well,” he said.